What’s for dinner tonight? Well I’ve never been a huge fan of tofu, but I was in a rush to cook tonight and decided to recreate a familiar flavour of “sausage seasoning”, along with the traditional meat and two veg scenario… without the meat… Perhaps I was inspired by the name of my awesome friend’s new vegan cookery class venture here in Edinburgh: “Me & 2 Veg” (love the name!). Click on the link to see her events page on Facebook. Enter my Crispy Tofu Bangers Bites, which I served with mashed potatoes, roasted red peppers (I cheated and got them out of the jar and lightly pan fried them), and broccoli. I don’t know what’s better: the fact I put this on the table in 20 minutes, or how yummy it tasted 😋. Tofu recipes tend to have an Asian feel to them, which is not surprising, given it is a product which originated in China and is widely used in East and Southeast Asian cooking. I have a strong sense-related memory however, and sometimes – particularly when the world around seems to have descended into chaos and the season tells me to curl up and hibernate – I just crave something that tastes like home. 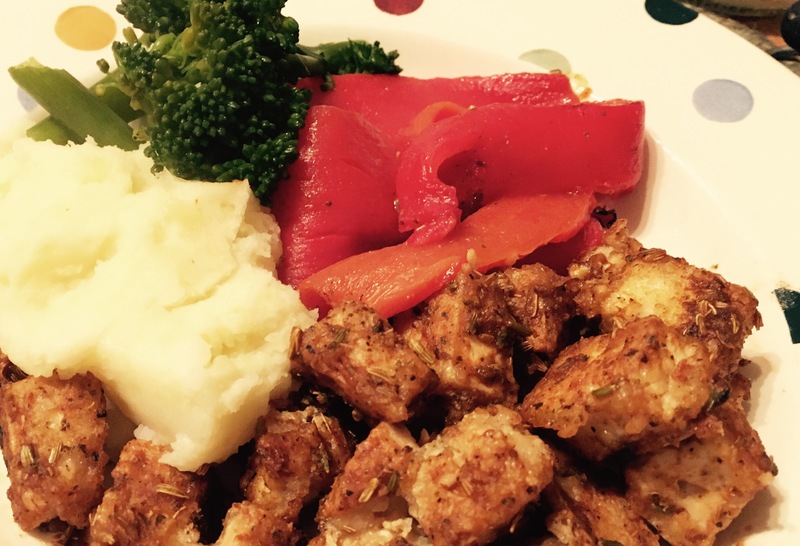 Most recipes recommend marinading tofu to give it flavour, but this has disadvantages: it prevents the tofu from getting super crispy on the outside, whilst staying soft on the inside (which is a texture I like; a lot); and it is also time-consuming as most marinades need to be left for at least 30 minutes, preferably a few hours. 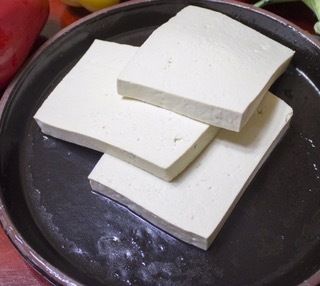 Tofu (bean curd) is made by coagulating soy milk and pressing the resulting curds into soft blocks. This process is very similar to cheese making but the coagulating agents used in producing tofu are not derived from animal products. Try to obtain tofu from organic non-genetically modified sources whenever you can. Consumption of tofu is not for everyone, and I believe that one should literally follow their gut feeling with this. It is a processed product which is a good protein source, and also a calcium source, depending on the way it was produced. There is equivocal data regarding the links between soy consumption and a decrease in breast and prostate cancer, decrease in post-menopausal symptoms and a lowering of cholesterol levels. As health claims and counter-claims are made, the only thing that remains is for you to trust how you feel, and pay conscious attention to how you respond to bean curd when you eat it. 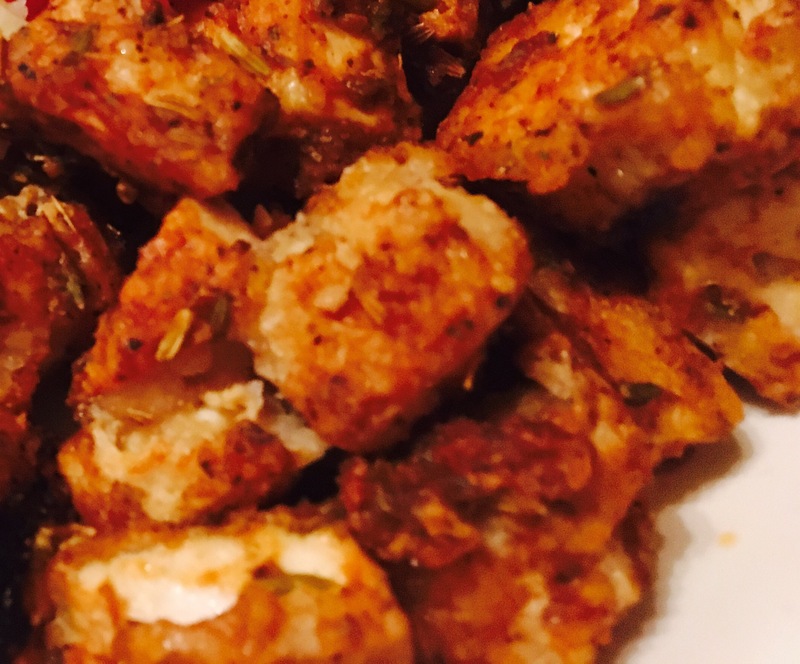 Here is the recipe for tasty sausage-flavoured crispy tofu bangers bites. Press down on the tofu with a heavy tin of beans on kitchen towel for 5 mins, sponging the moisture off. Rinse the tofu with a solution of very salty boiling water, then pat dry. Cut into small dice and sprinkle over the cornflour to coat. Heat the coconut oil in a large non-stick frying pan and fry the coated cubes on at least 2 sides until crisp (this should take about 7 minutes on a fairly high heat). While the tofu is getting crisp, prepare the “sausage” coating: grind the fennel seeds in a pestle and mortar, and add the garlic salt, smoked paprika, oregano and Himalayan pink salt. Add pepper to taste. Mix in the miso paste and 3 tbsp hot water and blend into a sauce. When the tofu is crisp, pour the sauce over to coat, and serve immediately with your favourite two veg.